Growing shares of minority voters have not yet turned these states blue, as many in both parties had once expected. Over the past three decades, Arizona, Georgia, and Texas have testified more to the limits than the possibilities of demographic change to remake the political landscape. For years, Democrats have hoped that the long arc of growing diversity will carry Arizona, Georgia, and eventually Texas back within their reach as politically competitive states. But those hopes have been repeatedly dashed, most recently in the 2014 midterm elections that produced stark Democratic disappointments on all three fronts. Yet in the years ahead, these fast-growing and now reliably Republican states are likely to become more important battlefields in national politics. One reason is that each of them—especially Texas—is essential to the modern GOP Electoral College strategy: It's difficult to imagine what combination of states could allow Republicans to replace Texas's 38 Electoral College votes if Democrats could somehow pry them from the GOP's grasp. The second is that these states are experiencing some of the most sustained minority-population growth anywhere; that growth is forcing Republicans to win an ever-larger share of the white vote to survive. Combined, these factors make it likely that Georgia and Arizona in the near term, and Texas in the more intermediate future, will remain high on the list of "reach" states that some Democratic strategists hope to bring back into play in presidential campaigns. But despite that steady growth in the minority population, Democrats have seen vanishingly few reasons for optimism in each of these states lately. By almost all measures, the Republican grip on all three has only tightened. Since 1992, the sole Democratic presidential nominee to carry any of these states was Bill Clinton, who narrowly captured Georgia in 1992 and Arizona in 1996. In each case, Clinton managed only a plurality victory made possible because independent candidate Ross Perot splintered the vote. In fact, in all three states, no Democratic presidential nominee since 1984 has amassed more than the 46.9 percent of the vote that President Obama attracted in Georgia in 2008. Since 1992, Democratic presidential nominees have averaged 44.5 percent of the vote in Georgia, 43.7 percent in Arizona, and only 40.4 percent in Texas. In 2012, Obama won a smaller share of the vote in all three than he did in 2008. The Republican position is, if anything, stronger down the ballot. The GOP holds all six U.S. Senate seats from the three states and in 2014 turned away a well-funded challenge from Democrat Michelle Nunn in Georgia while discouraging a serious opponent to Republican Sen. John Cornyn in Texas. In 2014 as well, Republicans comfortably defeated highly touted Democratic candidates to retain the governorship in all three states. Republicans hold a 5-4 majority in Arizona's U.S. House seats and advantages of greater than 2-to1 in both Texas and Georgia. The GOP also controls both state legislative chambers in each state. Arizona and Georgia, with their high-flying housing markets, were hit especially hard in the crash of 2008, while Texas weathered the storm better. But all three states are now thriving. Over the past year, Texas has created more jobs than any other state; Georgia ranks fifth and Arizona eighth. Since 2000, population growth in all three states has been propulsive: Arizona has increased its population by 29 percent (third among states), Texas by almost 27 percent (fourth), and Georgia 22 percent (ninth). Texas: No state has a wider gap between demographic possibility and political reality. Even as unstinting racial change has carried Texas to the brink of a majority-minority electorate, Republicans have solidified their hold over the state's politics. The 2014 election that Democrats hoped would demonstrate the awakening power of a Democratic coalition fueled by increasing diversity instead underscored just how far the party must travel to reestablish its competitiveness in a state it ruled unchallenged for a century after the Civil War. The state's underlying demographic transition is undeniable and irreversible. In 1980, Texas whites represented about three-fourths of eligible voters and exactly four-fifths of actual voters. Those numbers declined to about three-fifths of eligible and two-thirds of actual voters in 2000. By 2012, whites were only 54 percent of eligible Texas voters and 59 percent of the actual voting pool. Over these three decades, African-Americans have remained stable as a share of eligible voters (11 percent in 1980, 12 percent in 2012). But with improved turnout, they have roughly doubled from 8 percent to 15 percent of actual voters. Asians and others have also planted a flag: They were less than 1 percent of voters in 1980 but 4 percent in 2012. As throughout the Southwest, the biggest change has been among Hispanics: From 1980 to 2012, they doubled as a share of eligible voters (from 15 to 30 percent), and grew nearly as fast (12 percent to 22 percent) among actual voters. Minorities already represent a clear majority of the state's younger population (58 percent of eligible 18-29-year-old residents are nonwhite now), which ensures continued momentum for demographic change. 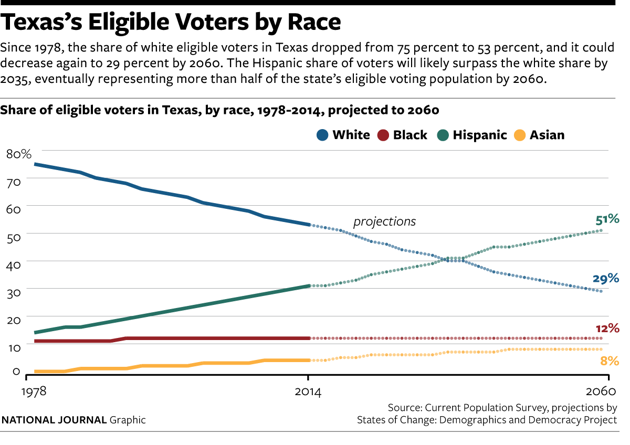 The States of Change model projects that in 2016, the white share of eligible Texas voters will drop 3 more percentage points (to just 51 percent) and then will slip below majority status (at 49 percent) by 2020. The model expects Hispanics to rise to one-third of eligible voters by 2020, with Asians and others remaining at about one in 20, and African-Americans stable at almost one in eight. By 2040, the model sees whites falling to just 38 percent of eligible voters, and Hispanics supplanting them as the electorate's largest group (43 percent). This demographic evolution has stirred Democratic hopes of "turning Texas blue." But political change hasn't followed. Republicans have established as dominant a hold on white voters here as anywhere. Exit polls in the 2000, 2004, and 2008 presidential races found Republicans limiting the Democratic nominee to only about one-fourth of whites each time; though an exit poll wasn't conducted in 2012, the fact that Obama lost the state by more than he did in 2008, while the white share of the vote dropped by fully 4 percentage points (in the census figures) suggests he may have ceded even more ground with those voters. In 2014, Wendy Davis, the Democratic gubernatorial nominee who launched her race with high hopes, also captured only one-fourth of whites, and the party's Senate candidate did not reach even that level. Democrats suffered landslide defeats in both races. Nor have Texas Democrats established the clear advantage among Hispanics that the party has built elsewhere. George W. Bush ran well among them in both of his gubernatorial races and both of his presidential races. Bush carried over two-fifths of Hispanics in 2000 and nearly half in 2004, according to exit polls. Obama in 2008 restored a Democratic advantage of nearly 2-to-1, but in 2014, the exit polls showed Texas GOP gubernatorial nominee Greg Abbott again capturing more than two-fifths of Hispanics. Polling by Latino Decisions, a Democratic-oriented private polling firm, has consistently shown smaller GOP inroads, but there seems little doubt that Texas Democrats have not established the preponderant margins among Hispanics that are common elsewhere. 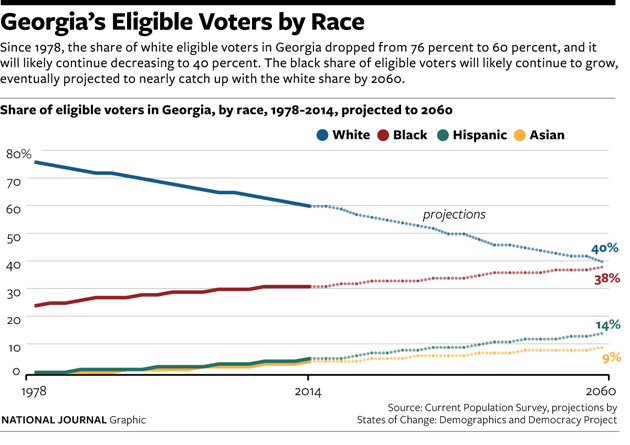 Georgia: Racial change here hasn't advanced as rapidly as in Texas, but it is proceeding on the same track. From 1980 through 2012, whites fell from three-fourths to about three-fifths of Georgia's eligible voters, and even more emphatically from over four-fifths to just above three-fifths of actual voters. Hispanics, and the combined group of Asian, mixed-race, and others did not constitute even 1 percent of eligible voters in 1980, but by 2012 the former had reached 4 percent and the latter 3 percent. (The two groups combined that year for 6 percent of actual voters.) And, in contrast to many other states, Georgia's African-American population, swelled by the reversal of the World War II-era "great migration" to the North, has grown from 25 percent of eligible voters in 1980 to 31 percent in 2012; even more dramatically, African-Americans over that period have doubled their share of actual voters from 16 percent to 32 percent. The States of Change model projects steady continued decline in Georgia's white presence—but with the locus of minority growth shifting toward the new immigrant groups. The model forecasts that whites will slip to 59 percent of eligible voters in 2016, recede further to 57 percent in 2020, and fall below a majority (at 48 percent) in 2040. African-Americans will grow slightly over that period (reaching 32 percent of eligibles in the next two presidential elections and 35 percent by 2040). The big change will come from Hispanics (forecast to increase their share of eligible voters by 1 percentage point in each of the next three presidential elections and ultimately to reach 10 percent by 2040) and from Asians and others, who will edge up more slowly but are projected to reach 5 percent by 2024 and 7 percent by 2040. This ongoing shift creates obvious opportunities for Democrats, who have maintained overwhelming margins among the growing African-American population and carried over three-fifths of Hispanics, Asians, and others in 2008, the last year a Georgia presidential exit poll was conducted. But the party faces two substantial obstacles. One is building the mechanism to identify and turn out the new immigrant voters in a state with no tradition of such organizing, and a weakened Democratic infrastructure of any sort. The other is Democrats' inability to capture even a modicum of white voters. No Democratic presidential nominee from 1992 to 2008 won more than the 32 percent of Georgia whites that Bill Clinton attracted in his first race, according to exit polls; Obama carried just 22 percent in 2008 and probably even fewer in 2012 (when, as in Texas, his showing in the state slightly deteriorated although the minority share of the vote grew). In 2014, two plausible Democratic candidates with impeccable family pedigrees—Senate candidate Michelle Nunn and Democratic gubernatorial nominee Jason Carter—each failed to win more than one-quarter of Georgia whites, and both lost by solid margins. Still the sheer magnitude of the state's demographic transition—and the fact that the change is driven mostly by African-Americans, who have proven more reliable than Hispanics in both their turnout and their Democratic loyalty—keeps the state in sight for Democrats looking to expand the presidential map. Arizona: Some dynamics in the state, particularly the steady decline of the white population, echo the experience in Texas and Georgia. In other ways the stories diverge. But the bottom line looks very similar to Georgia and (more distantly) Texas: Arizona remains a state where the opportunity for Democrats in practice hasn't nearly matched its possibility on paper. As in the other two "reach" states, whites are falling here as a share of eligible voters. But Arizona's white population started from a higher point (87 percent of eligible voters in 1980) and remains a bigger presence even now (whites were 67 percent of eligible voters in 2012). In 2012, whites cast 72 percent of the actual ballots in Arizona; they haven't been that much of the presidential-year electorate in Georgia since 1984 or Texas since 1992. With minorities already half of the eligible young-adult population, the model forecasts the white share of voters to fall more rapidly in the coming years—to 64 percent in 2016 and 61 percent in 2020, before dipping below a majority (at 48 percent) in 2040. While it forecasts the share of African-Americans to remain unchanged, it sees Hispanics rising to 24 percent of eligible voters by 2016 and 26 percent by 2020 before surging to 36 percent in 2040; the Asian, mixed-race, other group is also anticipated to rise, to 8 percent over the next two elections and then 12 percent by 2040. Though exit polls showed that both George W. Bush and John McCain competed effectively for Arizona's Hispanics (each winning between one-third and about two-fifths of them), Obama restored a roughly 3-to-1 Democratic advantage in 2012, after then-Republican Gov. Jan Brewer signed a harsh state law aimed at illegal immigrants. In the four presidential elections from 1996 to 2008, the Democratic presidential nominee carried about two-fifths of Arizona's whites each time. That led Obama campaign officials to initially talk about contesting the state in 2012, but ultimately they demurred, and Obama's white vote there plummeted to just under one-third. The Democratic position with whites doesn't appear to have improved since: Although exit polls were not available, in the 2014 gubernatorial race, Republican Doug Ducey pinned a surprisingly lopsided double-digit defeat on Democrat Fred DuVal, a credible centrist opponent. Texas: One reason Democrats have struggled so much with Texas whites is that they haven't received the lift from educational trends that have boosted them in new swing states such as Virginia and Colorado. As elsewhere, Texas's noncollege whites are overwhelmingly Republican: In 2008 (the latest presidential exit poll) Obama carried only about one-fourth of both noncollege white men and women, and in 2014, Davis sank slightly below that level. And, as elsewhere, these voters are shrinking as a share of the electorate: they were exactly three-fifths of actual voters in 1980 but only about one-third in 2012. But in contrast to other states, the difference is coming almost entirely from minorities; college-educated whites are not significantly increasing their role. College-educated white men were 9 percent of eligible voters in both 1980 and 2012, and college-educated white women inched up only from 6 percent to 9 percent. The two combined to cast 21 percent of actual votes in 1980 and 25 percent in 2012 (by contrast, in, say, Colorado, the two groups almost doubled their share of the vote over that time). Even more important, Democrats haven't made the inroads with these voters, especially women, that they have elsewhere: Obama in 2008 won just 20 percent of Texas's college-educated white men and only 27 percent of college-educated white women, far below his national totals. Even Davis in 2014 won less than three in 10 college-educated whites. Georgia: Another reason Georgia may present a greater near-term opportunity to Democrats than Texas is that its population of college-educated whites has been rising faster. From 1980 through 2012, whites with at least a four-year degree have increased from 12 percent to 20 percent of eligible voters, and from 19 percent to 25 percent of actual voters. College-educated white women, in most places the portion of the white electorate most receptive to Democrats, have accounted for all of that increase in the voting pool, almost doubling from 7 percent of actual voters in 1980 to 13 percent by 2012. The staunchly Republican noncollege whites have fallen over that same period from 64 percent to 37 percent of voters. But, as in Texas, Georgia Democrats have not made the inroads among college-educated whites, especially women, visible beyond Dixie. In 2008, the most recent year with an exit poll, Obama won only one-fourth of college-educated white women (no better than his showing among their counterparts without a college degree) and slightly less of the college-plus white men. In 2014, the exit polls showed both Carter and Nunn running better among college-plus than noncollege whites, but not by much: He attracted just three in 10 of the better-educated whites and she won just a little over one in four. (Neither reached even one in five of noncollege whites.) Even with continued minority population growth, Democrats will need to improve on those numbers with upscale whites to truly contest Georgia at the presidential level. Arizona: College-educated whites are also increasing only modestly in the electorate here, with women providing most of the growth. From 1980 to 2012, college-educated white men remained virtually unchanged, rising only from 15 percent to 16 percent of actual voters; the well-educated women edged up from 12 percent to 15 percent. More here than in Georgia or Texas, states with deeper traditions of religiously based social conservatism, Democrats have shown some potential with Arizona's white-collar women: They won at least 45 percent of them in both the 2000 and 2004 presidential races, although Obama fell back to about two-fifths in each of his two runs. To contest the state moving forward, the party will need to restore that competitiveness to offset weak showings among college-educated white men (just one-third for Obama in 2012); noncollege white men (no Democrat has attracted more than 32 percent of them since 2000); and noncollege white women (no Democrat has exceeded 38 percent of them here since 2000). The one consolation for Democrats, as elsewhere, is that noncollege whites dropped from just over three-fifths to slightly more than two-fifths of actual voters from 1980 to 2012. Texas: While education trends haven't reshaped the Texas electorate as much as elsewhere, the state is following the nation in its shifting pattern of marital status. Married couples were 69 percent of all eligible voters in 1980, but just 54 percent in 2012 (although they remained 61 percent of actual voters). In what could be a commentary on the state's vibrant job market, the population of single men has grown even slightly faster over that period (from 13 percent to 21 percent of eligible voters) than that of single women (from 18 percent to 25 percent). Georgia: The same trends are visible here. Married couples represented two-thirds of eligible voters and three-fourths of actual voters in 1980; by 2012, the numbers were 54 percent and 56 percent, respectively. Over the same period, single men have increased from 10 percent to 17 percent of actual voters, and single women from 16 percent to 26 percent, a similar pace of growth. Arizona: Married voters are diminishing here, too, but they retain a larger role than in Georgia. In 1980, they constituted 69 percent of actual voters; by 2012, that had slipped to 61 percent. The growth in singles has come entirely among unmarried men (up from 11 percent to 18 percent of voters); single women have grown as a share of the eligible population, but they remained stuck at exactly one-fifth of actual voters in 2012. That's another hurdle for Democrats, who generally run well among unmarried women. Texas: The state is aging, but not nearly as fast as many others, largely because of its youthful Hispanic population. In 1980, voters under 40 represented a 54 percent majority of eligible voters and voters older than 50 equaled just three in 10. By 2012, the under-40 group (at 43 percent) was only slightly larger than the over-50 group (at 39 percent). Those older voters, who represented just 38 percent of actual voters in 1980, cast a 53 percent majority of votes in 2012. So far, so typical. But in contrast to other states, the model projects the state's senior population stabilizing at around two-fifths of eligible voters in 2016 and 2020, and then rising only slightly above that by 2040. The under-40 population is forecast to stabilize at just over two-fifths through 2020 before slipping just below that level by 2040. Voters aged 40-49 will also remain stable at around one-sixth of eligible voters—roughly their share since 1980. Another state quirk has faded. In an inversion of patterns elsewhere, through as late as 2004, Democratic presidential nominees here often ran better among older whites—some of whom still clung to the state's long "yellow dog" Democratic tradition from roughly the century after the Civil War—than among younger whites. But with those "FDR seniors" passing out of the electorate, the GOP has established the dominance among older Texas whites common in most other states. That frames the overlapping generational and racial tension likely to mold the state's political future. As noted, minorities already represent nearly three-fifths of the state's eligible young adults (18-29). The model projects them to rise to nearly two-thirds of that group by 2028 and fully 71 percent by 2040. But whites today still constitute almost three-fifths of eligible voters aged 50-64 and two-thirds of eligible seniors. Texas's minorities will move into the older population more rapidly than in many other places, but by 2024, the model still projects that whites will equal half of the near-retiree eligible voters and three-fifths of seniors; minorities are not forecast to reach half of the senior population until 2040. Reconciling the contrasting needs and priorities of a younger nonwhite population that generally supports public investment in health care and education and an older white population committed to low taxes and less government may prove as complex and contentious in Texas as anywhere. 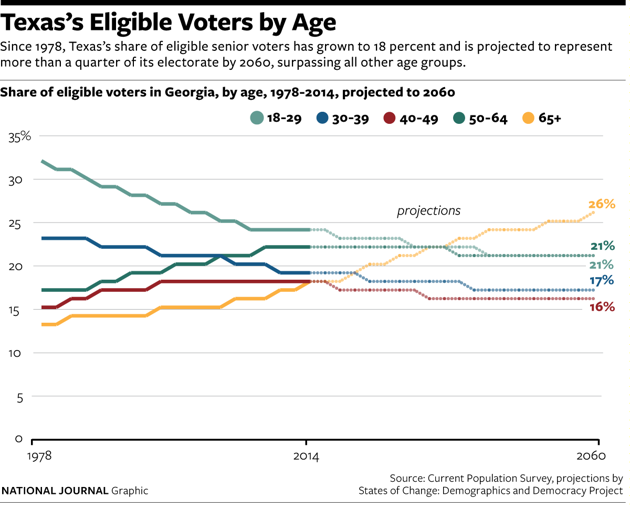 Georgia: Like Texas, Georgia is aging, but on a more moderate track than many other states. The state's experience over the past three decades is familiar: While residents under 40 (at 53 percent) significantly outnumbered voters over 50 (at 31 percent) among eligible voters in 1980, by 2012, the two groups had converged at around two-fifths of the eligible pool each. (Voters 40-49 over that period edged up from about one-sixth to nearly one-fifth of the total). Looking forward, the model projects the over-50 share of eligible voters to rise steadily from 41 percent in 2016 to 43 percent in 2024, reaching 46 percent by 2040. It anticipates the under-40 share of eligible voters to slip slightly from its 42 percent in 2012 to 39 percent by 2024 and 38 percent by 2040. Republicans are dominating whites among all age groups in Georgia. By 2004, the Democratic heritage among older whites had faded (Bush carried nearly four-fifths of Georgia white seniors that year), and the GOP has run very well with the white millennial generation that showed more receptivity to Obama elsewhere: He won only about one-fifth of them here in 2008. As throughout the Sun Belt, the more powerful dynamic is the intersection of race and age. Minorities are already 48 percent of the state's eligible young voters (18-29) and will rise to 52 percent by 2024 and 60 percent by 2040, the model projects. But whites today represent 66 percent of the 50-64 eligible population and 70 percent of eligible seniors; by 2040, whites will still represent exactly half of the former and a clear majority of the latter. 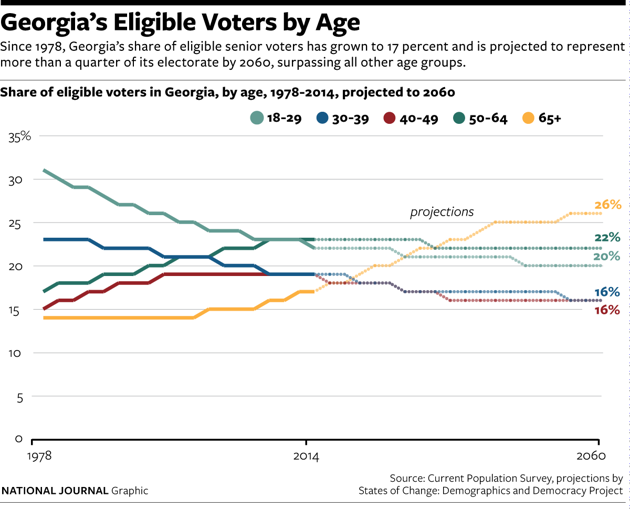 The model projects that minorities won't reach half of Georgia's senior population until 2055. Arizona: Befitting its reputation as a retirement haven, Arizona starts with an older population than either Texas or Georgia and is projected to grow more deeply gray over time. Residents 50 and older represented 43 percent of Arizona's eligible voters in 2012. That's up from 35 percent in 1980 and more than the 40 percent of eligible voters today under 40. (Those 40-49 represent the final roughly one-sixth of eligibles.) The gap in actual voting is even larger: while voters younger than 40 cast 30 percent of votes in 2012, those over 50 accounted for 54 percent. The model projects that residents over 50 will steadily expand as a share of eligible voters (to 45 percent by 2020) and hit 48 percent by 2040, before essentially stabilizing there. It forecasts the under-40 share contracting slightly to 39 percent in 2016 and then shrinking further to 37 percent by 2040. Nowhere is the "cultural generation gap" wider or more jagged than in Arizona. Minorities already account for half of the state's young-adult eligible voters, but they constitute less than one-fourth of its eligible seniors (as well as just three in 10 of the near-retirement 50-64 cohort). By 2024, the model projects that minorities will represent a clear 56 percent majority of eligible young adults, but still only 36 percent of the near-retirees and exactly one-fourth of seniors. Even by 2040, when minorities are forecast to reach two-thirds of the young-adult population, they are expected to comprise still slightly less than half of near-retirees and only one-third of seniors. 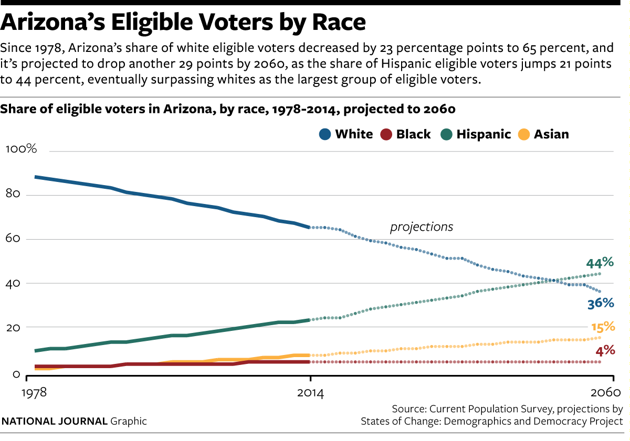 Minorities younger than 50 won't equal whites older than 50 as a share of eligible voters in Arizona until 2032, the model forecasts. The distance between the preferences and priorities of these two groups befits a state that houses the Grand Canyon. 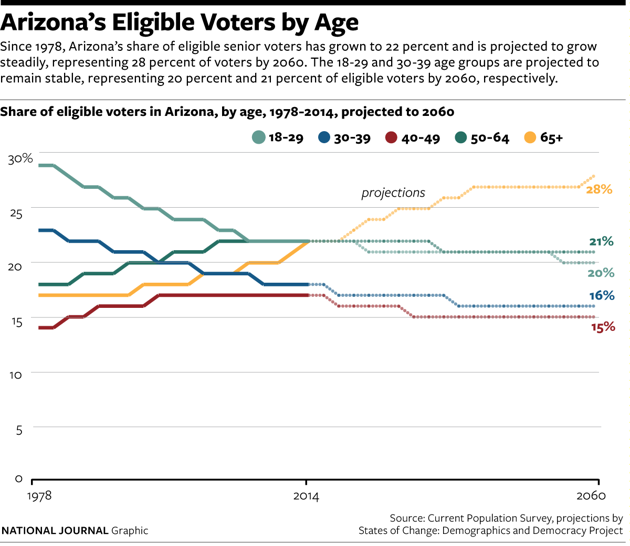 In 2012 Obama won 63 percent of Arizona young-adult voters and just 29 percent of its seniors. The explosive battles Arizona has experienced in recent years over immigration, gay right,s and social spending could be only the first tremors of the turbulence that lies ahead as these two massive but divergent generations jostle for control of its direction.